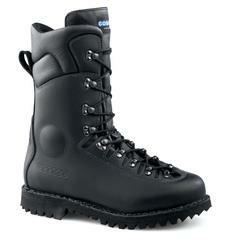 GENERAL – 9” high, black, leather lace-up mountaineering-style boots. One piece, full-grain, water-resistant leather upper, ANKLEARMOR™ ankle guard, Achilles flex point, Bi-Zonal lacing, micro fiber suede heel slide. Boots meet or exceed NFPA 1977, Standard on Protective Clothing and Equipment for Wildland Fire Fighting, 2011 Edition.